LOCATION: This home is walking distance to the beach and seaside. DETAILS: This home boasts breathtaking gulf views, a luxurious private pool and spa, and convenient beach access just a short walk away. Comfortable furniture and inviting decor will make you feel right at home the moment you walk through the door. 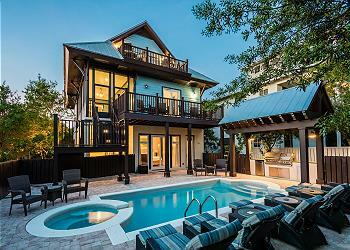 Kick back, relax, and enjoy the South Walton lifestyle to the fullest at this fully-equipped home. Cruise the neighborhood by pedal power on the provided bikes, take in the splendor of the Gulf of Mexico on a beach day, spend the day relaxing by the sparkling pool, or enjoy an awe-inspiring sunset from your beautiful balcony, -- the choice is yours. Book your next stay today and let the fun in the sun begin! OTHER AMENITIES INCLUDE: 4 adult bikes provided, walking distance to beach, private pool. This property comes with 7 dedicated parking spots. Complete Clean Linen Participant - ALL linens, including comforters laundered upon every checkout. We had a fabulous time even though the weather was not ideal. The house is beautiful and updated, with ample room to not be on top of each other. The outdoor space is awesome, as well as the proximity to the beach!! "Shore to Have Fun" was an amazing property! We had the best time! The house is perfect in every way. The 360 Blue team was immediately responsive to the couple of issues we had, resolving them immediately! 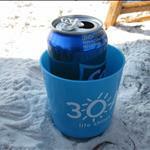 We have already been discussing booking our next beach vacation with 360 Blue, possibly at "Shore to Have Fun" again! Great place to stay. Close to beach. Second time to stay there and will stay again. We are so glad that you enjoyed your vacation with us! We look forward to hosting you again very soon! We loved the home! We’ve used 360 Blue on several occasions and they are second to none. Amazing homes, clean linens (including bedspreads) and prompt service! We have owned a vacation rental home on 30A and it was managed by a competitor. We wish we had known about 360 Blue at the time. 30A is a very special place. There is no other beach in the continental US that has sand as white as snow and water as clear as the Caribbean. Thanks for another wonderful vacation! We are so glad you enjoyed your vacation! We agree that our beaches are the best and the photo you shared is proof of that! We are overjoyed that you have had such a wonderful experience with 360 Blue. Should you require a management company in the future please keep us in mind and we hope to host you and your family again very soon! 25 Kristi Lane was all we asked for and more! Beautiful home, lovely location, and all the amenities we needed and wanted. We will definitely be back! 360 Blue was an incredible company to work with, and will be highly recommended. Many thanks for a wonderful trip for our family, filled with great memories! We are so thrilled that you enjoyed your time here in Seagrove! 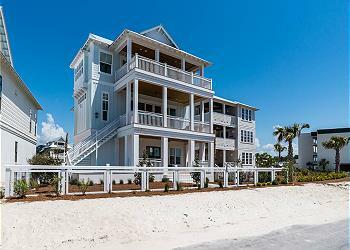 This home definitely is a wonderful choice for a relaxing beach vacation! We are so glad you had a wonderful experience with our team and we hope to assist you in vacation planning soon! I planned a "staycation" locally for my birthday. "Shore to have fun" was perfect! We enjoyed the pool, the private beach access, enough room for everyone and the great views! We even caught the eclipse! I would highly recommend this home! 360 Blue did a great job contacting me before, during and after my stay! Aarien saved the day when the TV went out, came right over and had it fixed in 20 mins! We had a great time! What a great photo! We are thrilled you enjoyed your "staycation" so much! We are so happy you all enjoyed the home and that you were able to catch the eclipse too! Thank you so much for staying with 360 Blue and we hope to have you back again soon! We came down for Spring Break with 2 other families and had 5 adults, 7 kids at the house. The house was perfect. The beach access was close and most days, we felt like we had the beach to ourselves. 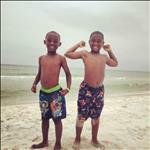 We come down every spring and fall break and have stayed at numerous properties in Seaside and Seagrove. Shore to Have Fun is by far one of our favorites. What a stunning photo! One to definitely frame for those days when you need a little beach! 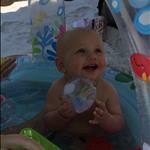 We are so happy you and your family enjoyed your stay so much in Seagrove! Thank you for choosing to stay with 360 Blue and we hope to have you back again soon! Was a wonderful summer vacation! Thank you to the owners!! We are thrilled that you had a great stay. We hope to have you back soon! Terrific vacation house! Perfect location to the beach! Hi Conroy Family: Thank you for staying with 360 Blue! We are excited to hear you enjoyed your stay at 'Shore to Have Fun.' We hope you will stay with us again in the future! What a fabulous stay for our girls' vacation (my mother, my daughter & 2 friends, & myself)!! Shore To Have Fun was PERFECT for us!! We enjoyed the beach, riding bikes to Seaside & eating at The Red Bar. We were so sad for the week to end but look forward to coming back next year!! Thank you 360 Blue!! What a fun way to spend the week. Thank you so much for choosing 360 Blue. We look forward to having you back next year! What a beautiful moment captured, so precious! Come visit us again soon, thank you! Shore To Have Fun far exceeded our expectations. 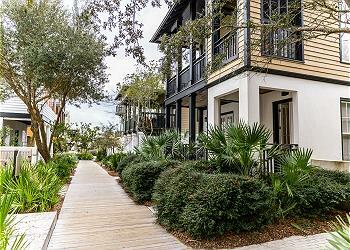 The house is beautiful and clean, with an upscale beachy feel, we felt very at-home. 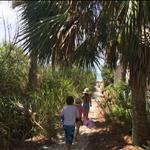 The walk to the beach was a short one, even with a toddler in tow. The pool was large and accomodating, we especially loved grilling by the pool while everyone played. We had a blast biking around 30A (one of my favorites, next to lounging on the gorgeous beach)! The setting was serene and even felt like our own private beach. The views from the rooms were amazing, too. We can't wait to continue making memories at this house for years to come!!! You captured such a beautiful picture! We're thrilled to hear you found your 'home away from home'! This home is in such a great location and we so glad you enjoyed your stay here. Hope to see you back on the beach soon! Thank you for choosing 360 Blue! We loved your house. It's the perfect set up for a couple of families and the beach is just a short walk away. I was especially impressed with the property management company. They did a great job! That sunset photo is absolutely beautiful! Thank you so much for choosing 360 Blue and for taking a moment to share your experience. We are glad to hear that you enjoyed your stay, and we hope to see you back soon! It is so great to hear you all enjoyed your visit, especially Baby George! Looks like he had a splash at the beach! Thank you so much for staying with us in Seagrove. See you next time!! This was the perfect house for our large family! From the lovely home, location, well equipped kitchen, swimming pool, hot tub, ocean view, bikes and private path to the beach!! Our grandaughter requested a swimming pool, hot tub, cool staircase & bunkbeds. All was delivered with perfection! We hope to come back next year. Would highly recommend "Shore to Have Fun"
Aw, look at those little explorers! So cute! Thank you for staying with us at Shore to Have Fun! We hope to have you back next year as well!! Wonderful house!! Definitely one of our favorites!! Great location, awesome pool, clean and spacious. We highly recommend "Shore To Have Fun". 360 properties is fantastic too!! See you next year! What a beautiful family you have! Thank you for staying with 360 Blue! We are so happy you loved the home and great location. See you soon!! This house is really great and we enjoyed ourselves tremendously. Great place for families and parties and hanging out with friends. The best part was the swim pool for the kids and a very short walk to the beach. It is a private area with private beach access and you can't beat it for the dollar here near Destin Florida. Oh my goodness! What handsome boys! They sure seem to be enjoying themselves in this photo! It was such a pleasure to have you and your family as our guests. Thank you so much for choosing 360 Blue for your summer vacation. We are thrilled to hear that you enjoyed the home and your stay. We hope you'll be back soon! Great home! Perfect for multiple family vacation. Loved the pool area and the quick, shady path the private beach. Plenty of room to hang out together, but yet had enough privacy, if needed. Easy reservation process and loved the informative app. Thank you so much for your review! We appreciate you guys more than you will ever know.